Life is not always as it seems, and this is particularly true in the world of film and television. Whilst we’re all used to the computerised visual effects used in modern films, we are probably not as aware of the level of special effects used in the film’s soundtrack. Any modern blockbuster film will invariably be liberally splattered with awesome special visual effects (CGI). We’ve come to expect it. However, while our eyes are being bombarded with spectacular visual sequences our ears are also being attacked with a host of auditory stimuli to trick us into believing what we see is real. The audio production of a film never attracts the same kudos as the visual effects. Yet, get it wrong and the visual sequence just won’t have the same impact. Get it right however and you’re transported into a different world completely. It’s all smoke and mirrors! This week I was lucky enough to have been afforded a guided tour around a sound production facility at Pinewood Studios, England, home of famous James Bond stage. The audio production facility is run by Reelsound, a company that specialises in all aspects of audio production for films from ADR recording, Foley, Dialogue Editing, Sound Design through to the Final Mixing. Some of the recent film projects that Reelsound have been involved in include St. Trinians, Perfume, V for Vendetta, Wolfhound, Bridget Jones and Love Actually. The actor’s dialogue is recorded during the filming process. Unfortunately however, the audio quality of this production sound is not always up to scratch, and will often require additional work to improve it. Sometimes, this will require the actors to re-record their lines in a studio, a process known as Automated Dialogue Replacement / Additional Dialogue Recording (ADR). The new dialogue will then have to be mixed and edited to synchronise with the video and fit in with the existing audio in the audio post production facility. Alternatively, if the existing dialogue (production sound) is of sufficient quality it may be used, but may contain extraneous noises picked up on set that have to be removed in the editing suite. Even the simplest film sequence, such as someone walking across a gravel drive for example, is not always as it seems. While such a sequence won’t require any special visual effects, often special sound effects are used. For example, the sound of footsteps on gravel are often added in an audio production facility after filming. The addition of such everyday sound effects is called Foley, after Jack Foley, one of the first sound engineers who used such effects when sound was first added to films in the 1920s. Reelsound’s facilities at Pinewood Studios use state-of-the-art computer systems for the audio editing of foley and dialogue, and also for special effects creation. These computer audio systems are referred to as Digital Audio Workstations (DAWs) and use the industry standard software, ProTools, produced by Digidesign. 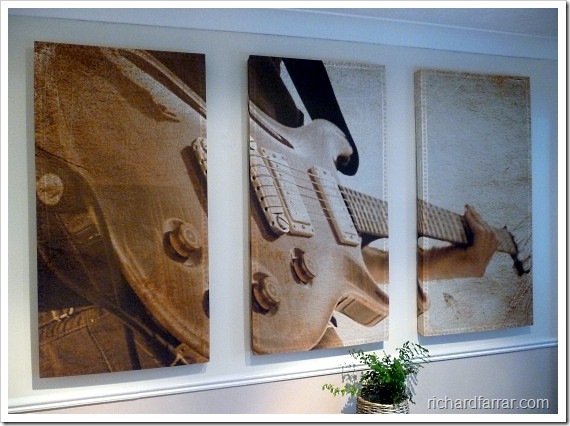 Special effects are created by layering many different, and often commonplace sounds together. Each of these sounds may then be adjusted and manipulated by the editing software in host of different ways to produce completely new sounds that often bear little resemblance to the original source sound. This is clearly an extremely time consuming business, with the entire audio production for a blockbuster film often taking six months or more. …and you thought the visual effects took all the time! Once all of the separate sound sources have been recorded, cleaned up, or even created in the case of the special effects, they are then all mixed together to form the final audio track of the film. The final mix will invariably incorporate the dialogue (arguably the most important audio element of all), foley (the natural sound effects), the special sound effects and the music. To make all of this happen, a significant investment in the latest technology is required. We’re all used to banks of computers that the likes of Pixar use to generate their computer animation sequences, and while the audio production of films don’t use anything like the same level of raw processing power, pretty sophisticated computer systems are still required. The computer systems used by Reelsound are all high specification Apple Macintosh PCs; the industry choice of computer platform for this sort of work. 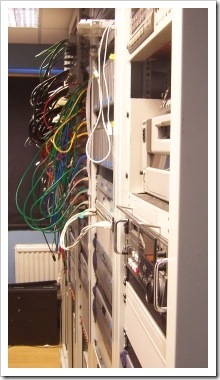 The PCs are all kept in a single server room (pictured left) and networked together to share audio data. A vast library of sound effects is stored on an Apple X RAID server giving fast performance with huge storage capacities. Using this system, any of the digital audio workstations in the editing suites have instant access to almost any sound effect imaginable via a searchable database of sound effects. Each editing suite is equipped with full 5.1 surround sound monitoring using Dynaudio AIR active studio monitors and sub woofers. Dual video monitors are used to display the digital audio workstation software running remotely on the Macs in the server room, while a third monitor is used to display the film or video for which the audio is being edited. So next time your watching the latest Hollywood blockbuster with Bruce Willis running around in a vest blowing things up, close your eyes for a moment, listen to the rich textures of the sound track and spare thought for the poor sound engineers cooped up in darkened rooms for months on end purely for your pleasure. …and next time you see foley artists mentioned in the credits of a film, you’ll know exactly what they do! My sincere thanks to Max Hoskins and all of his staff who extended their courtesy during my visit to their facilities at Reelsound. Good publish, I can see how awesome video actually is! audio post production is really very difficult task but also interesting one.through this blog explanation i found found all technique related to audio posting and its promotion.. really excellent one explanation..